From today until Friday, August 5th, the free KTQ50 film is Milking the Rhino (2008). "A common theme in Kartemquin docs is that making a living is a political matter. Simpson skillfully adapts that perspective to rural Africa, where investing in wildlife links the Masai and others to the new globalism." A ferocious kill on the Serengeti… dire warnings about endangered species… These clichés of nature documentaries ignore a key feature of the landscape: villagers just off-camera, who navigate the dangers and costs of living with wildlife. The Maasai tribe of Kenya and Namibia's Himba – two of Earth's oldest cattle cultures – are in the midst of upheaval. Emerging from a century of "white man conservation," which turned their lands into game reserves and fueled resentment towards wildlife, Himba and Maasai communities are now vying for a piece of the wildlife-tourism pie. Milking the Rhino has won six best documentary awards at film festivals around the world, as well as several awards for best cinematography. 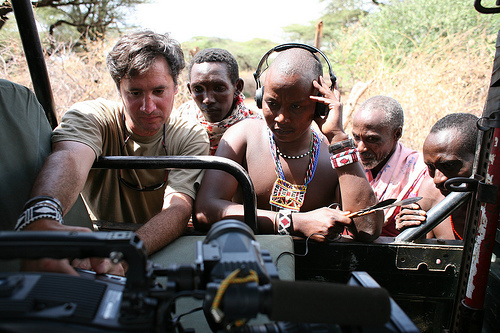 The film originally aired on PBS Independent Lens to great acclaim, and has played in 25 countries on six continents. Milking the Rhino hasn't only inspired critics and conservationists— the film was the catalyst for creating an environmental filmmaking competition called the "Milking the Rhino Innovative Solutions Showcase", a competition that invites student teams from around the world to create a 3-minute video that promotes a solution to a problem presented in Milking the Rhino. More than 62 videos were submitted on topics including nutrition and sustainable development, and you can browse them on this YouTube playlist. Milking the Rhino is available on DVD here.